I first saw these Raf Simons embroidered derbies while absentmindedly scrolling through Grailed. When they popped up, I was immediately enamored with their aesthetic although I experienced massive sticker shock at the asking price of over 600 dollars. Upon further research, I discovered that they were only available at Colette for a brief period of time in 2009. After that, any trace of them pretty much vanished other than a few Pinterest blog posts. 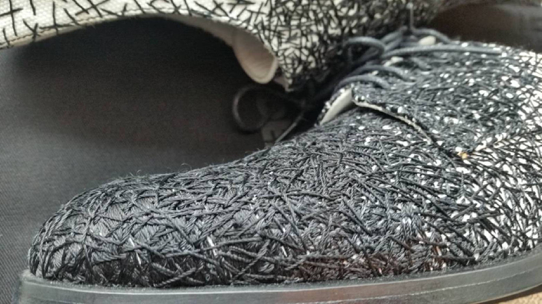 Just finding additional images of the shoes to write this article was a hassle in itself. Raf Simons has always been one of my favorite designers since I stumbled upon his iconic 2003 F/W collaboration pieces with Peter Saville. I love the texture of the stitches on the surface of the derbies, especially given the contrast of the black thread with the stark white leather base. It gives the shoes a very tactile quality that most footwear lacks. The embroidery is also cleverly self-referential in alluding to the construction process of high-end stitched leather shoes. 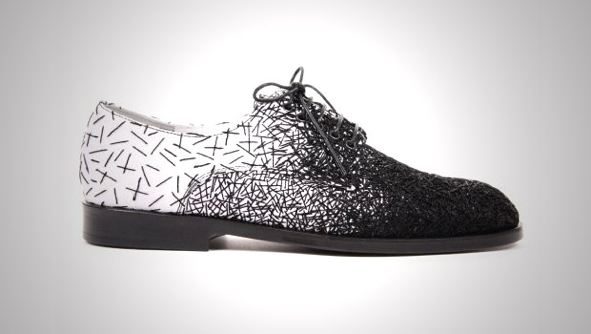 The lack of availability and high price tag of these shoes definitely make them my holy grail. The concept behind them is unique, but might be replicable given the right materials. Who knows? Maybe I’ll eventually be able to create my own DIY homage to these Raf Simons stitched derbies.